U.S. PGA Championship: An Asia-Pacific Winner? Many Asia-Pacific golfers have a shot at the U.S. PGA Championship. We consider their odds here. The U.S. PGA Championship, with a hokey slogan of “Glory’s Last Shot,” is much maligned for its perceived lack of prestige compared to its Grand Slam brethren. It also doesn’t help that golf’s last major each year also routinely produces unheralded winners who were never heard from again after hoisting the Wannamaker Trophy. Remember Rich Beem? Shaun Micheel? Y.E. Yang? All three will tee up Thursday at Oak Hill (in Rochester, New York) as past champions, but none will attract very much attention. Neither Beem nor Micheel are currently playing on the PGA Tour, having lost their status. Yang is largely forgotten after his historic victory in the 2009 tournament, in which he became the first player to defeat Tiger Woods after Woods held a third-round lead at a major championship. Unfortunately, Yang has not won a single PGA Tour tournament since and has slumped to No. 256 in the Official World Golf Ranking. He is unlikely to end his drought anytime soon, having missed the cut at more than half of the tournaments he’s entered this year. There are, however, plenty of players from the Pacific Rim capable of taking the season’s final major. Sure, the field is loaded with 99 of the world’s top 100 players (No. 16 Louis Oosthuizen is out with injuries), but that only adds to the intrigue at an Oak Hill layout that is both quirky and tough. 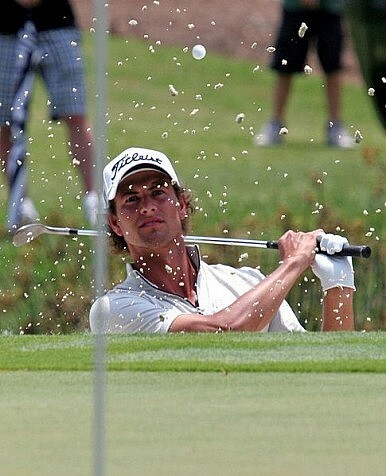 10-1 odds Adam Scott (No. 5, Australia, Thursday tee time 1:45 p.m. EDT): Scott became the first Australian to win the Masters in April and just barely missed winning the Open Championship for a second straight year. With veteran caddy Steve Williams on his bag, Scott is supremely confident and playing the best golf of his life. With a win Scott would become the first Australian to win two majors in one year and match Greg Norman and David Graham for second-most major titles among players from Down Under. 25-1 Jason Day (No. 20, Australia, 12:55 p.m.): Day is surely Australia’s current nearly man with several near misses at major championships. He came tantalizingly close at the Masters for the second time in three years and finished tied for second at the U.S. Open this year. Day’s play down the stretch at the majors proved his downfall, but there’s no question he has the all-around game and just might be on the cusp of a breakthrough. 75-1 K.J. Choi (No. 100, South Korea, 8:55 a.m.): Choi is no stranger to contending at major championships, with six Top 10s in his career, including a pair at the PGA Championship. Choi is one of the fittest golfers on tour and his age, 43, should not be an issue as Phil Mickelson has ably demonstrated this year. Choi’s play this year has been steady if not spectacular, so a strong showing at Oak Hill – as long as he can sink a few critical putts – really isn’t out of the question. 100-1 Geoff Ogilvy (No. 88, Australia, 1:30 p.m.): After his breakout victory at the 2006 U.S. Open, Ogilvy has not been able to match the enormous expectations placed on him. His play this year has been very spotty, with a bunch of missed cuts to go with a single Top 10 finish when he placed second at the Honda Classic in March. It might be a bit much at this point to believe that he could become the first Aussie to win the PGA since Steve Elkington in 1995. 150-1 Hideki Matsuyama (No. 33, Japan, 7:45 a.m.): At 21, Matsuyama has the makings of the next Asian superstar. The world’s top-ranked amateur last year turned pro in April and his performances since have not disappointed, finishing tied for 10th at the U.S. Open and tying for sixth at Muirfield last month at the Open Championship. He might need a bit more seasoning before he can be declared the Asian version of Rory McIlroy, but Matsuyama might not be that far off. 200-1 Marc Leishman (No. 71, Australia, 7:30 a.m.): After three consecutive Top 10 finishes – including at both the Masters and Players Championship – it seemed like Leishman could be the next rising star from Down Under. But after tying for 12th at the Byron Nelson in May, he has missed the cut in half of the ensuing events, including both the U.S. Open and Open Championship. Unless Leishman rediscovers his touch around the greens quickly, he’s no more than a very long shot this week.